Requests from more than 16,000 Californians to carry a concealed gun in public are in limbo, pending a final decision in a landmark lawsuit that’s scheduled to be reheard today in a federal courtroom in San Francisco. Some of these requests are in file boxes down the street at the San Francisco Police Department, which saw a spike in applications after the 9th Circuit Court of Appeals struck down the state’s “good cause” requirement as unconstitutional last year. Should that decision be overturned, odds are that none of the applications will be approved; San Francisco has issued fewer permits in the last five years than any other county in the state. Typically a few pages long, the applications quickly get personal with details seemingly unrelated to guns. At least two applicants admitted to smoking marijuana in college, for example. Others delve into work history and threats of violence on the job, while some highlight relationships gone bad and subsequent restraining orders. Some applicants were brief and to the point, like the consultant who simply wrote “self-defense” as his reason for wanting to carry his Sig Sauer P226 9 mm pistol. Another woman applied for a permit because she heard about how “a young boy was killed for trying to sell a PS3 (PlayStation 3). I’ve also been thinking of selling some of my shoes and I would feel safer knowing I am able to carry a concealed weapon,” she wrote in her application. 70,593 – The number of Californians with an active concealed carry permit. That’s about 0.2 percent of the state population, well below the national average. There are an estimated 11 million concealed gun permits nationwide, representing about 5 percent of the population. 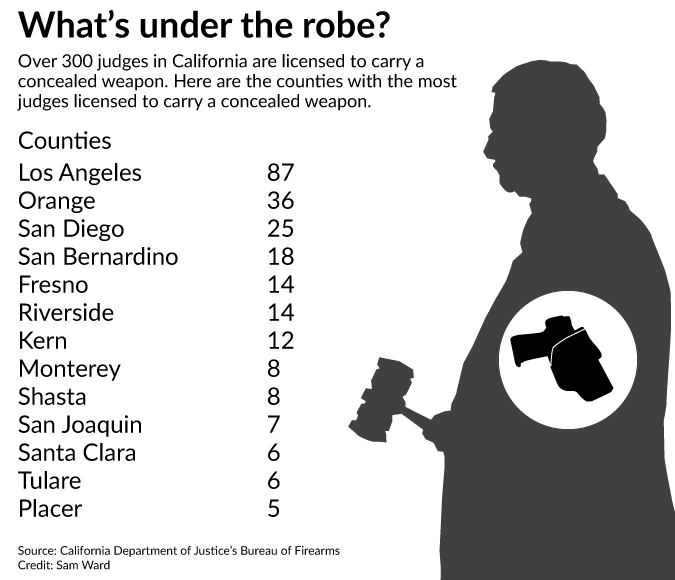 316 – The number of judges permitted to carry a concealed gun in California. More than a quarter of them – 87 – reside in Los Angeles County, more than twice the next highest county. 16,106 –The number of pending permits as of Dec. 31, 2014. This number has gone up every year since 2012, when there were fewer than 5,000 pending permits. Many are on hold until the 9th Circuit Court issues its final decision in Peruta v. San Diego County.